I was able to play Euphoria multiple times this week after hearing a couple people raving about it. How did it hold up to the hype? I played with the kickstarter components, and they were AMAZING. Like seriously, seriously amazing! In a future dystopian world, these components would count as a bliss resource for your gamers, enabling you to work them hard and then still gain morale even though you haven’t given them any food. I plan to purchase these, as they would be usable in a wide array of games, given the ubiquitous nature of these resources in games. The theme of the game is a humorous take on a Dystopian future. A comedic 'Brave New World'. How well did the game fit the theme? The best part to me was the ‘markets’ that you build. Essentially, these are buildings that you construct with the help of other players (or maybe alone), which then provide you points as well as abilities. But wait, unlike in other board games, the buildings don’t give YOU abilities. Instead, the thing you are building gives a disadvantage to all other players that did not participate in making it! For example, build the Spa of Fleeting Pleasure, and your opponents can no longer place workers onto spaces containing their other workers to bump them. Construct the Cafeteria of Nameless Meat, and damage your opponent’s morale when they don’t pay food for their workers. Found the Academy of Mandatory Equality, and your opponents can no longer use the special abilities of their recruit cards. I liked the mechanic of ‘buildings don’t help you, they just screw everyone else’. Not only is it a new mechanic which hasn’t been used much in other games, it also fits the theme extremely well. We are building a Dystopian society. You don’t make things that improve your life, you just make things that make everyone else’s lives worse! Haha! Another thematic element is the intelligence level of your workers. Whenever you retrieve a worker from the board, you roll them, determining the workers amount of knowledge. If the collective knowledge of your unplaced workers ever gets too high, then one of them realizes they are living in a Dystopia and runs away. Unfortunately, this part didn’t go over as well for me. In general I’m not a fan of dice rolling, but I do like dice rolling if it is used in a way where the die roll provides different options to the player, instead of having certain rolls be better and others just worse. For the most part, the die rolling in Dystopia comes down to this: You really, really want to roll doubles, because then you get free turns. Barring that, lower is pretty much always better and safer. The doubles rolling providing free turns is especially egregious in a strategy game that is essentially a race game. The game is a race to build up your economic engines and then score points, and actually contains a minimal amount of player interaction (aside from fun things like: I built this building, now it imposes X restriction on all of you). In a race game with minimal player interaction, free turns are pretty much the best thing you can get, and Euphoria hands them out semi-randomly. Roll doubles? Get free turns! Now, there are things you can do to improve your odds of getting more doubles. Having more workers increases your odds of pairing up numbers due to rolling more dice! And you can sit in a cycle where you have a couple dice in reserve, and you constantly place a die to bump your own die and reroll it, hoping to roll one of the numbers of your reserved dice. That said, these ‘strategies’ to maximize your doubles chances are pretty obvious and fairly easy to do. There isn’t a whole lot of skill involved, and the impact of gaining several free turns over the other players because you got lucky will often prove decisive in an otherwise well balanced economic race game. Aside from the doubles, I also wasn’t a big fan of the worker knowledge mechanic. First of all, it didn’t feel all that thematic. Every time a worker goes and works, the result is that his knowledge randomly changes to a new value between 1 and 6. How does that work, really? Also, worker knowledge is almost never useful. (I guess that is part of the theme, smart menial laborers don’t work better than dumb ones?) For the most part, the knowledge mechanic only served to randomly screw people (or not), during the course of the game, making some people lose workers, while others rolled lower and hummed right along, building their economy engine and scoring VPs. Again, there are ways to mitigate your worker loss. You could grow less workers in the first place (probably not a good idea), or you can maintain a cycle of keeping a worker or two on the board, and then continually placing and bumping your own workers (which works quite well for certain actions). Still, the risk mitigation strategies are pretty easy to see and execute, so it’s not like there is a ton of skill there. And when you roll three dice and they turn up a 15 and cause you to lose a worker, it just feels pretty bad. You don’t get any compensation, and the fact that your remaining workers are smart doesn’t actually help you. How could the worker knowledge mechanic have been improved? First of all, I feel that higher knowledge should be able to benefit you sometimes. In truth, it occasionally does, as there are a few spaces where a high knowledge worker might enable you to gain an extra resource (at a cost of further making your workers more intelligent, which is bad), but these cases occur very rarely. Second, rather than just randomly changing in knowledge value every time they are used, it would be cool if knowledge were a growth or level of mechanic for your workers. Imagine the possible story arc of a worker placement game where as you place them, your workers might ‘level up’ (become more knowledgeable). Or not, depending on how you use them. As they gain knowledge they open up more capabilities: Maybe you need smarter workers to go to certain spaces. Maybe they gather more goods. Or maybe they have improved power to bump other workers if they are smarter than them! But then, as your workers get too smart, things get riskier, and eventually they leave you! Time to go to the vats and grow a new dumb worker again! I read in another thread on BGG that the designers initially tried a system like this, and they felt it was ‘too spreadsheet like’, and they discarded it in favor of rolling the workers. To that I say: I guess you didn’t try hard enough! Dice can do interesting things in a game, give people hard choices, or force them down unique strategy paths. Or they can just provide variance. Not the good kind of variance, where the results are all sort of balanced, and you have to explore different game paths as a result, but the bad kind of variance, where you just shove an advantage in one player’s face, and kick the other player when he is down. 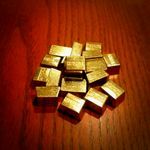 The random rerolling of the intelligence of the workers, and the lack of any benefit from higher intelligence workers, represents a missed opportunity to use the dice in an interesting way, and instead results in them just being variance. As a serious strategy gamer, this is very distasteful to me. Of course, not everyone feels this way, some people like the variance, and won’t mind this at all. Finally, one more supposed thematic element is the “moral dilemma” card. Supposedly, you must make a choice during the game between fighting against the system and supporting it. For example, you might receive a card allowing you to “choose true love” or “accept your assigned match”. However, the only thing this actually means is that either you get a free victory point by going along with the system, or you get a bonus character card for fighting it. That’s it. I found this underwhelming. This is supposed to be a big moral dilemma? It felt like a pretty obvious choice (character early, or VP late), and not very thematic. 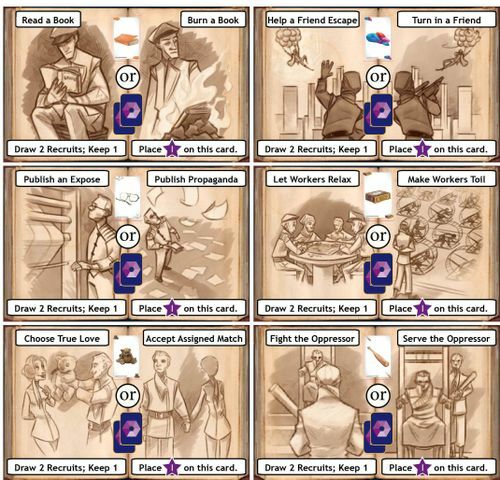 In Euphoria there are four different factions, represented by areas of the board, and some of your actions can improve the standings of those factions. As a faction increases, it provides special powers to players who have a character of that faction. (You can get characters in up to 3 of the 4 factions during the game). I liked the characters (there are a huge number of different characters with various special abilities), and I liked that you can draft the characters at the start of the game, and that you receive 4 and are able to choose 1 to start and 1 to acquire later as a hidden character. Aiding your faction is definitely an important part of the game, and it is in this area that most of the player interaction actually appears. Which factions to you help? Which do you ignore or try to hinder? What factions are the other player’s hidden characters? The variety of different characters helps the game to play differently each time, and provides replayability. One missed opportunity here was that the faction alleigance tracks all do exactly the same thing, except for one of the abilities of one of the four factions. I really wish that the factions played very differently from each other, and provided highly different bonuses. Euphoria is actually a faux-worker placement game. Let’s define “worker placement” to mean “placing workers onto spaces on the board to ‘draft’ their effects, and then the workers block other players from those effects in some way”. Some people have incorrect ideas about what that phrase means! It doesn’t mean anything where you stick pieces that represent ‘workers’ onto spaces. Puerto Rico isn’t “worker placement”, you are just using pieces to help run your economy. The way people normally use “worker placement” is to indicate the drafting of options in a way that then blocks other players. Worker placement provides a significant amount of player interaction into games (often most of the interaction for a particular game). Games like Agricola and Caylus are thus “worker placement”. In Euphoria, however, no space is EVER blocked. You can always go anywhere you like (a particular construction space doesn’t really count). Instead, for some of the spaces, the effect changes based on how many workers are placed there, while for most of them, you simply bump whoever was there out of the space. As a result, it’s not really a worker placement game, and also as a result, the player interaction is a lot lower than in things like Agricola. While there is some player interaction, in the form of players pushing the different factions up the faction development tracks (or whatever they are called), and in terms of the buildings you build effecting each other, or the character powers, for the most part it’s pretty minimal. You don’t really impact each other that much in this game, mostly you perform your own little race to see who can build up and score faster. Actual space blocking would greatly ramp up the player interaction. Space blocking which was in some way related to the intelligence of the workers might have been really interesting! But alas, it is not to be. Personally, I don’t really mind low interaction, racing type games. But some people really crave more conflict. Euphoria doesn’t provide all that much conflict. In a way, it’s kind of the opposite of Race for the Galaxy. Race for the Galaxy might look like it’s purely a race, with little interaction, but it actually has a large amount of interaction, it’s just often hard for new players to see it because they are too overwhelmed by thinking of their own position to start looking at what their opponents are doing, and trying to predict their role selections. Euphoria on the other hand kind of looks like it has a lot of interaction. (“Worker placement! !”) But it actually is more of a pure race, with minimal amounts of interfering with each other. Euphoria plays 2 to 6 players and for the most part the quantity of options available doesn’t change based on player count. As a result, 2 players will play Euphoria with an almost entirely empty board, hardly ever bumping each other, while in 6 players, the worker bumping will actually play a large role in the game. I played multiple times with 3, and bumping hardly ever occurred, which was disappointing. Additionally, the different factions can build tunnels into each other, (to then steal their resources). However, the tunnels take many actions to build, such that in our 3 player games, about 1 tunnel would get build per game, right at the end of the game. I could imagine that in a 6 player game, they would finish in the midgame and actually be interesting, but for a game with a low number of players the tunnels are WAYYY too long. You cannot really complete them in time to do anything with them. I feel that some scalability was needed here, with the length of the tunnels shrinking based on the player count. My feelings on player count are that small games go very fast, which is nice, but the board is so huge and empty that you’ll never really run into each other, whereas in a big game the bumping and the tunnels work as intended, but you will suffer a lot of downtime. Liked: Theme of the market buildings (funny + mechanically cool). Character cards with wide varieties of powers. Factions and hidden characters. Replayability. Humor. Disliked: Low player interaction. Die rolling knowledge mechanic wasn’t very interesting and mostly just provided variance. Hated: Doubles free move mechanic giving out random free turns in a racing game. Living in a Dystopia apparently provides you with fabulous components, but in other ways, life is a mixed bag. Can't agree with this enough. Lost the win in a game when the player immediately before me scooped it with a double turn. No one at the table found it an exciting upset. Don't think about it as a worker coming back to you randomly smarter or dumber. Each time you roll the die, it's a whole new worker. The prior one has become part of the faction that you sent him to work at, though secretly on your side and sneaking resources to you. Or, if you're morbid, he's been worked to death. The new roll represents the intelligence of the next guy you recruited to help build your empire. Completely agree with everything you said. It's like you sucked the nascent review out of my brain and posted it. Thanks so much for detailing your experience with Euphoria here. I always enjoy reading constructive feedback about my games. "I do like dice rolling if it is used in a way where the die roll provides different options to the player, instead of having certain rolls be better and others just worse." --I think this might be a difference in personal preferences. I designed Euphoria to specifically not be the type of game where the numbers on the dice subscribe your actions. There are reasons in games that you want to limit players, but that way just doesn't click with me. There isn't a right or wrong answer here--just different preferences. "Imagine the possible story arc of a worker placement game where as you place them, your workers might ‘level up’ (become more knowledgeable). I read in another thread on BGG that the designers initially tried a system like this, and they felt it was ‘too spreadsheet like’, and they discarded it in favor of rolling the workers. To that I say: I guess you didn’t try hard enough!" "One missed opportunity here was that the faction alleigance tracks all do exactly the same thing, except for one of the abilities of one of the four factions. I really wish that the factions played very differently from each other, and provided highly different bonuses." --Sure, that would have been interesting, and it's something I've heard about each faction's areas as well. There are two issues with it: One, in a game where each player has asymmetric powers through their recruit cards, a number of other elements of the game need to be static, not variable. If there are too many asymmetries, it's really tough to balance the game. Two, you've seen the board. There's a lot going on, especially when you first learn the game. Earlier versions of the game had variations on the faction areas, and it made the game really hard to teach. Some consistency is helpful so our brains can make sense of the big picture. I'm tempted to reply to your section about Euphoria not being a worker placement game, but I'll stay out of that debate. Thanks for the review! At first I was not interested in playing Euphoria because I do not particularly like dice rolling games. I then watched a couple demos of the game and was won over by the way the dice are used in a mechanic that is somewhat new to me. I consider this a worker placement game, there are creative ways to use a worker to block abilities and actions of others. The mechanic is designed in way that one is not restricted from placing workers where you want them to go as long as you can pay the cost. IMHO, this games takes at least 3 times being played before one can understand the levels of strategy to enjoy the flow of the game, even if it does feel like a race to some people. Thanks for pointing out that it is a racing game with minimal player interaction. A definite pass for me because of objective mechanical drawbacks despite the good looking appeal, theme and components. I wouldn't call this a racing game or minimal player interaction. This is definitely a worker placement game. If you define worker placement as 'Placing Workers to draft their effects' it obviously fits, but let’s take your definition “placing workers onto spaces on the board to ‘draft’ their effects, and then the workers block other players from those effects in some way”. There are plenty of ways to block players from those effects 'in some way'. If you park a higher level worker (4 or above) on Commodity Area you can block others from advancing the allegiance track for that faction, and depending on the total worker level cause them to gain an intelligence. If you place a worker(s) on a market spot you can stop other players from using a particular type of resource to place their worker there. Not really blocking other players but if you place a worker on a space that allows 'bumping' you can save yourself a turn having to remove that worker from the board. Not quite as immediate as rolling doubles but very useful in this game. There is tons of interaction and ability to block workers. Advancing the Faction allegiance tracks is probably one of the most interactive parts. People with multiple recruits of the same allegiance will want to work on advancing that Faction's allegiance track, and try to hinder others and vice-versa. This is all achieved through getting commodities and using markets to assigning stars to the factions. This isn't done in a vacuum. Of course you could end up not wanting to advance a track that you share with another player as advancing it could give them the win. Others are the bumping. This is one of the most valuable rules, I'd say it's more valuable than rolling doubles. If you can really get the pulse of the game and place your worker on the correct bump spots, you can significantly reduce your need to retrieve workers, which is huge. Another often over looked aspect of the game, especially with people new to the game, is the aggressive bump. It doesn't happen a lot, but some times a person will retrieve workers and leave a worker on a bump spot. If they do this with a high over all knowledge, you can bump their worker, which forces a re-roll of the bumped worker. If they are sitting on 14 or 15 total knowledge, you are all but guaranteed to make them lose a worker. There is some lesser interaction through recruit cards and a few other smaller aspect. Building markets is also very interactive, especially with more than 3 players. You'll very seldom build a market by yourself in a 4-6 player game. Being able to judge when to start building a market, and hoping that everyone else will decide to also build on that market is very interactive. In a 2 and 3 player game you'll a much better chance of building markets by yourself, but the interaction is still there as you have to have the resources and have doubles to build them by yourself, unless your opponent really doesn't have the right resources, and then they should probably we working on ones where you don't have the resources anyway. As for blocking, it has already been said, but there are multiple ways to block. Blocking the 1-4 knowledge faction allegiance advance on commodities by placing a 4-6 knowledge worker there and never removing it. Leaving two workers of a combined 8 knowledge on a commodity to force other players to take knowledge for the higher resources. Blocking the single type resource spot of market construction sites to force what resources other players have to spend to help build it. It definitely fits the description of both a race game and a worker placement game. Is the worker placement aspect as cut throat and critical as it is in Agricola? By no means is it the same level. Worker placement games have evolved by a significant amount since Puerto Rico and Agricola. Games can still be worker placement without all of them having the same level of interaction and blocking. They have to evolve in order to not be stagnant and not be just another derivative/clone of something else. Euphoria is an excellent example of this evolution. Sounds suspiciously like the ageless Grognard debate "is this really a wargame"
I have found there is a decent amount of player interaction. Its very mild compared to wargames, but seems about typical for a Euro. As for the doubles, while it is so visually compelling "ugh, you got another pair of doubles" I cant say it makes a huge difference. A pair of 5s looks good, unless you are trying to push your faction up, which requires low numbers. And those doubles can easily result in a lost worker if you dont keep your knowledge well managed. I know my last game I won even though I barely rolled any doubles while others were hitting doubles constantly. The dice, doubles, and special abilities are clearly there to keep this from just being a dry "maximize your placement options" game. Variability can keep things from being chess like, but you also have the risk of the occasional "lucky" gamer who just gets 5 crits in a row. I think it works well in Euphoria, but I also see how it would bug some people as it puts randomness into the logic puzzle they enjoy. My biggest critique so far is that the hidden markets dont get accessed by new players. I think for new players you need to have the markets visible so people can see the benefit of building a market. Like all good philosophical debates, its a debate over terms. If you want to say "worker placement means the drafting/blocking of actions", then its not worker placement (and neither are some other games that some people call worker placement). If you want to say "worker placement means choosing actions by placing tokens on them", then it is worker placement. We are all in agreement about what you are actually doing, its just a disagreement on terminology. The games we played definitely had a lot of player interaction. Lots of alliances where made in getting the markets constructed as quickly as we could and screwing over other players with the penalties. One of my favorite aspects of this game! Jamey is definitely correct about asymmetries; they are impossible to balance. Look at a game like Terra Mystica. Amazing (and playtested) as that game is, look at how some races are way stronger than others. Same goes for occupations in Agricola. I don't care how good you are at that game, if you don't get the cards, you won't win. I play that doubles can only be used with loss of morale. There should be some cost, luck aside, with benefiting from doubles. Same here! Aside from the awesome components, the markets were my favorite part of the game. They are very funny as well. It just felt like other than the markets, there wasnt much interaction. With markets + workers blocking in some way, there would be plenty. I didnt really mind the low interaction at all. I was just noting it for the people who really seek heavy interaction in their games. (For me, the only real negative was the variance of rolling doubles). I played for the first time the other night with some worry over the comments regarding randomness. I didn't find it a problem at all and thoroughly enjoyed the game. The comment that someone beat someone else to the win by rolling doubles on the last round doesn't take account of the doubles probably rolled by the previously leading player prior to this. Like all dice games the dice go around and over the course of the game will likely balance out. I found it in no way over-reliant on luck. Our 4 player game went to the wire, with one player about to win just ahead of a second player, unless a third player gifted the win to the second player (by building a market everyone but the imminent winner was placed on) thereby finishing second not third and condemning the player who was about to win to last place on a tiebreak! Just played a game about two weeks ago, 4 player game, everyone finished with 1 star left. I would have won if I had managed to draw an artifact for my Moral Dilema but failed to do so twice, including a my last turn where I placed a star on the Icarite faction and drew an artifact card hoping to get what I needed. Everyone was a turn or two away from placing their last star as well. Great game. What I've found in the games I've played (all with four or more players) has been that we tend to race to the end, we tend to be pretty close at the end, and each player tends to specialize to some extent, while those whose "specialties" are left alone by the other players (ie, really cornering Icarite abilities or having a lock on multiple markets) tend to do the best because their economic engine is left to run unimpeded. The moral to that: make sure you disrupt anyone ahead of you, especially if no one else is. The rolling doubles mechanic was maddening in two games where it just seemed to happen a LOT, like more than should statistically have happened - we had triples twice in one. That's just how the luck rolled. I've played other games of Euphoria without a single roll of doubles. I understand the qualms about "too much randomness spoils a good strategy", and I agree, I just don't think it's too much here. The effect is potent but it doesn't happen that often over multiple games. Again, I've played these as 4 or more players in a game. I could see room for tweaking in a 2-player game to increase interaction. You may dance on compeltely opposite spaces of the board most of the game. Or you may play very tightly, one trepidatious to play on a basic resource lest the other seize advantage from that play.